My name is Aliman Sears from the Island of Oahu, Honolulu, Hawaii (Kailua side). My primary work is chief operating officer and co-founder of a nonprofit psychiatric social work agency. I am also adjunct professor of philosophy at Chaminade University, Honolulu. How did you hear about GTD? In 2016 during meditation I “directly received” that I could get myself organized and relieve stress if I captured everything, decided what needed to be done with it (if anything), then wrote it down on my “To Do” list. Note I had never heard of David Allen nor GTD. I started doing these three steps, and it radically changed the way I worked in a wonderful way. But I didn’t have the benefit of the whole system, so I was still struggling with “not enough time.” Fast forward to March 2018 at the end of a meeting, when one of our consultants said, “David Allen, who has a system called GTD, says that at the end of a meeting you should have clear actions to take, and you should define in a very concrete way the next, actual, physical action that you need to do to move the project forward.” I just stared at him—I was stunned. My inner/intuitive fireworks blasted into the sky. Before everyone was even out of my office, I jumped online and ordered FIVE copies of David’s book—sight unseen! I somehow knew this was it! The books arrived about a week later, and by page four I was amazed and knew I had finally found something to help put things in perspective. I gave copies to my key staff, and we’re now in process of implementing GTD company wide. How long have you been practicing GTD now? How has GTD made a difference in your work and life? A) My office is pristine—only R.E.D.S and nothing else—it’s been that way for six months. This one fact is amazing! B) My staff is chagrined because they always said, “Don’t worry, Aliman will forget about X and Y.” And they were right. But since GTD I don’t forget anything anymore. C) After a few months of GTD, I stopped waking up at 2:00am wondering and worrying. D) I get 100 emails a day and had 1,000 in my inbox; now my inbox is zero at least once per day and nothing “slips through the cracks” any longer. E) I FINALLY have a handle on everything I’m committed to; I know exactly where all my projects are or are not, so I no longer have a gnawing sense in the background that worries me about whether or not something is done. What areas of GTD are you doing really well (or at least better than you used to)? Email inbox to zero. 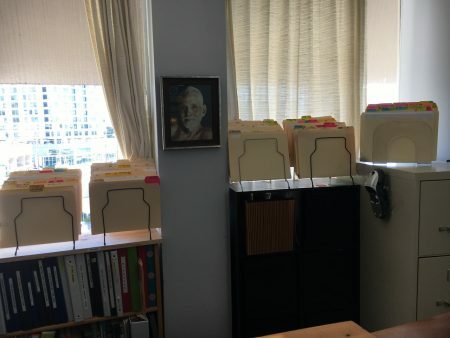 Also, I now have in my office a manila folder system for all my projects that display on a long shelf behind me (about 120 projects) so everything is at my fingertips. The file folders are numbered and the numbers correspond to control numbers on my Projects Lists and Next Action Lists. What areas of GTD would you like to get even better at doing? Weekly Reviews! Also, I need to settle on a paper system or electronic. I sort of do a mixture now and I’m not sure that’s going to work well in the long run. I took the Focus Survey and got some coaching from Frank Sopper, which was tremendously helpful. Next I’ll do a little coaching with a certified GTD coach (next week) and really look forward to bringing my practice to the next level. What is one piece of advice you would give to someone just starting out with GTD? If you’re just starting out—PLEASE—just read David’s book (2015) and implement it as he recommends. I can’t tell you how much pain I went through trying to tweak the system in a way that seemed it would be easier for me. That backfired! 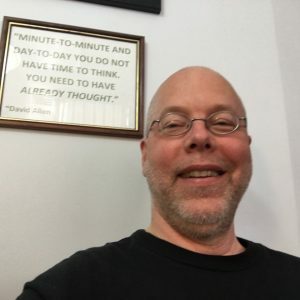 I went through about SIX ITERATIONS of my system, and each time it got closer to David’s, until when it was finally settled and working well, and to my chagrin, I saw it was exactly as David had set out in the book! Now, months later, I have tweaked it a bit to fit me better. But in the beginning save yourself a lot of time and resources and implement it as David suggests—there’s a reason he wrote the book and set it out that way! I would love to know where you get the manilla folders and the coloured folder tabs etc for your system so they are so easily and clearly visible. One question I’m curious about: you say your office is pristine, with only R.E.D.S. What does that represent? Hi Melissa, good question. REDS is an acronym for reference, equipment, decoration, and supplies. The idea is that your work area doesn’t have unclarified “stuff” hanging around to interfere with your focus. It’s equivalent to a creative chef having a clean, organized kitchen, or a surgeon having the right equipment at the ready in a clean operating room. I use regular five-cut manila folders that are available at any local office supply. For the colored tabs, I use “full stick” neon Post-It notes. The entire back of the Post-It is sticky, and these things are GREAT. I use them for many things. For my folders, I simply cut them with scissors to fit the tabs. I hand-number them and reuse them again and again.